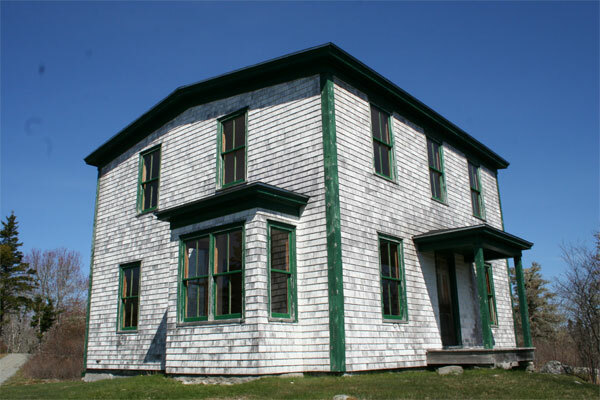 We have been in Nova Scotia now for 2 1/2 years and have somehow missed out on a visit to the Thomas Raddall Provincial Park, until this past week-end. The park is closed until the May holiday, so we had the place totally to ourselves and nature. We started out by walking the 3km entrance road that takes you to the main office building and the start of the trails. 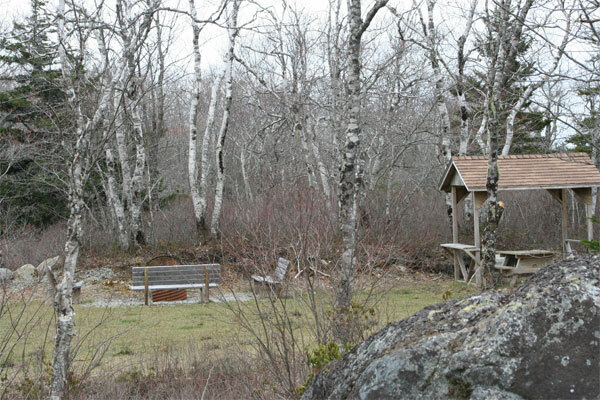 This is a wonderful place for campers and each camping spot is individual, with its picnic table and fire pit. 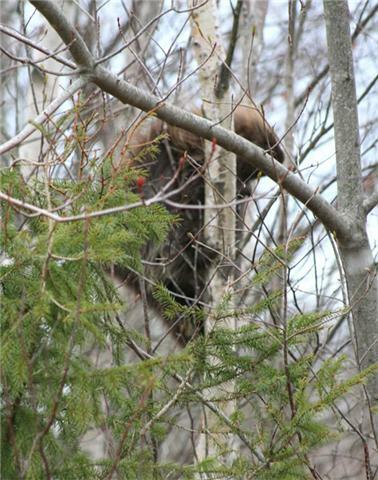 Thomas Raddall Provincial Park is a wilderness park and is a sanctuary and breeding ground for animals including bear and moose. The trails pass through different habitats: from pine forest, to hardwood, from sandy beach to pebble shore, bogs, lakes and old farm fields. 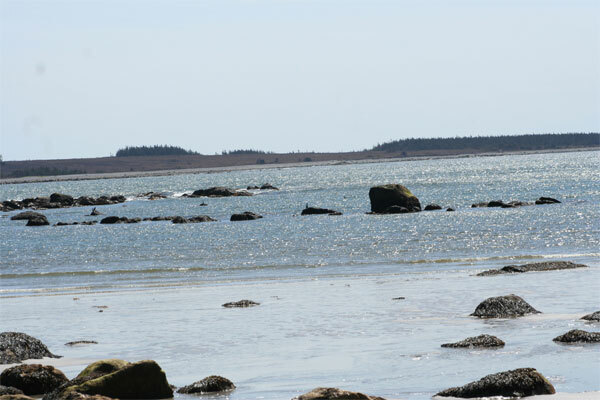 From this beach below you look across to Kejimkujik Seaside Adjunct, which I wrote about last July and November. You can see those articles by clicking on the tag, ‘Kejimkujik’ in the right hnd column. We came across an old farm house in the forest. I have found out that it was built by John Edgar MacDonald in 1918. He and his wife Grace raised 12 children here! Like farmers on the West Coast of Scotland, the MacDonalds would have a subsistance farm, raising sheep on the sparse pasture among the rocks, hunting moose , trapping mink and digging clams. But mostly, John MacDonald and his sons would fish from small inshore boats, like their grandfathers before them. 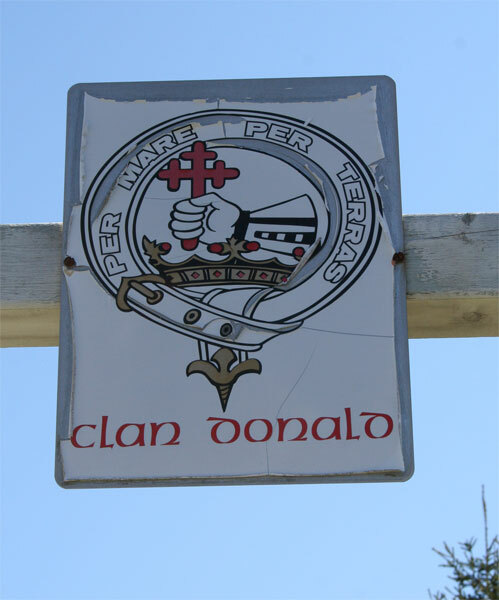 Just beyond the house is the Clan Donald Cemetery, with the graves of the families who lived here. 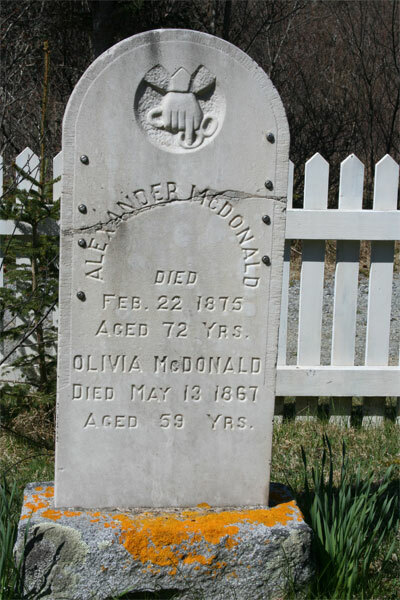 The oldest marked grave we found was this one of Olivia McDonald, who died in 1867. Some graves have McDonald and some MacDonald. 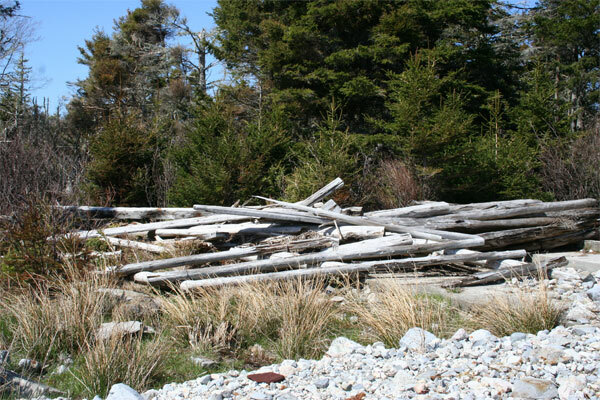 We found the foundations of an old log cabin, probably one of the original homesteads, down on the beach. This would have been their view from the front door. 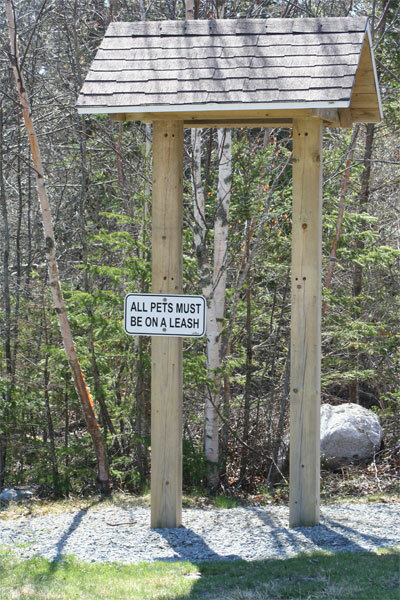 The park has its rules about pets. But we wondered if someone’s dog had been unlucky. 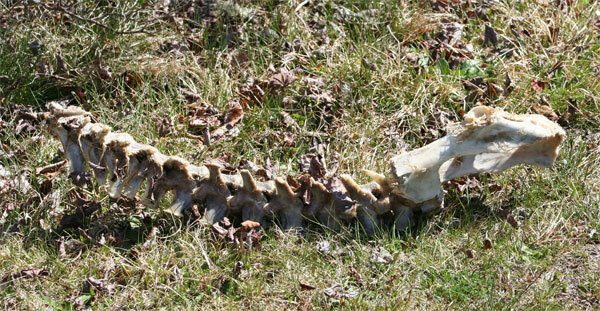 Or is this the skeleton of a deer or porcupine? 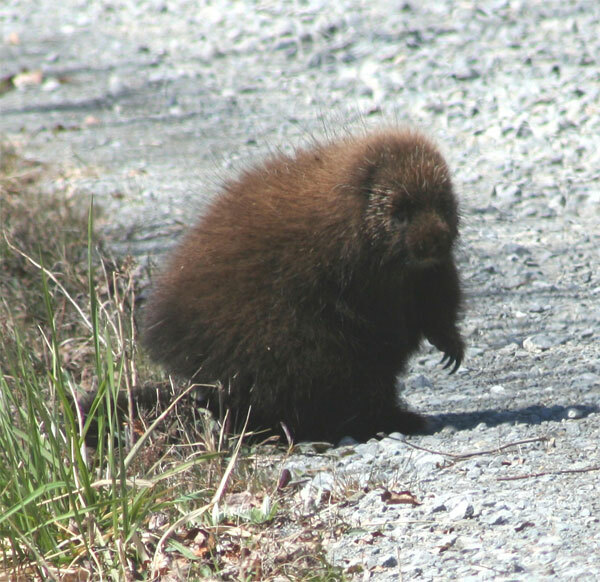 There are certainly plenty of porcupine in the area and this one seemed to enjoy having its photo taken. Whereas this one scurried up a tree. 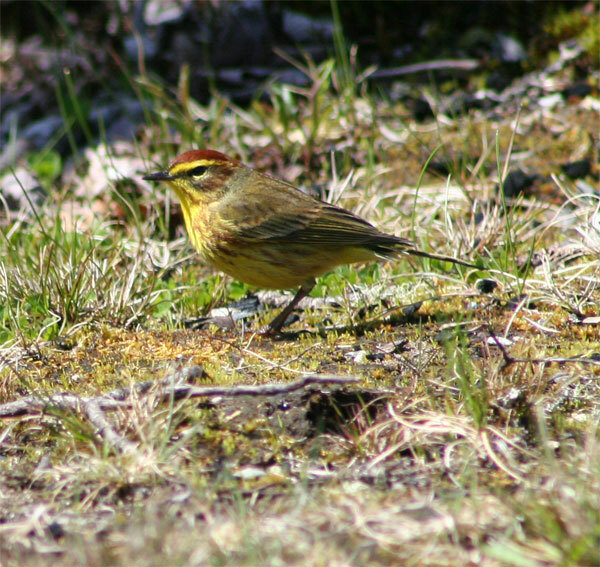 This little Palm Warbler came down to see us as we had our picnic. This is another first time sighting for us. 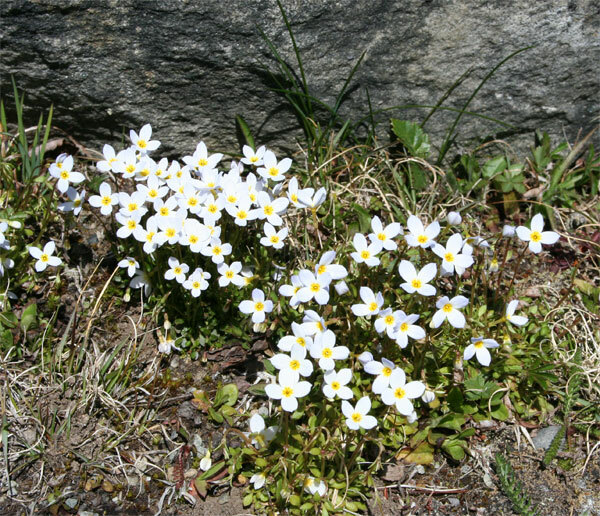 The first of the Spring flowers, brighten up this rock. 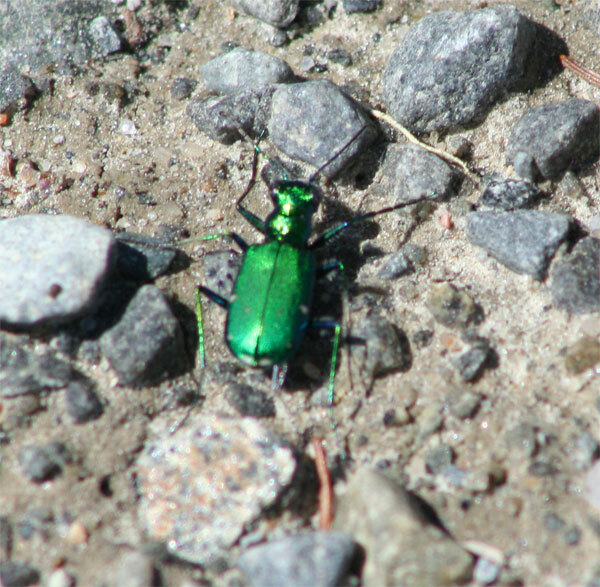 I think this iridescent green beetle is fantastic. We enjoyed walking the trails, but equally it would be great to cycle around. This will be another of our favourite hiking places. We finally made it across to Blomidon Provincial Park, another of our favourite places, especially in the fall. The park closes at Labour Day week-end in September, but that just means you can’t take your car right into the park or camp at the sites. We started out along the Jodrey Trail and took this photo looking back along towards Wolfville. There were still some leaves left on the maples, beech and oaks, but a greater number on the ground. The holes in this dead tree amazed us, but I have been reading that they were probably made by the pileated woodpecker. That is a bird we haven’t spotted yet. It is large and makes these holes to get at ants and other insects. 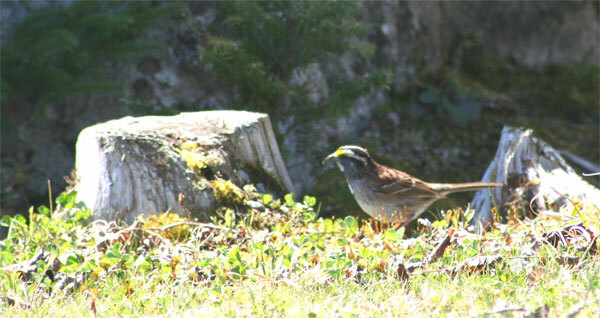 It then makes its nest in one of the holes. Other birds and animals use the other holes for their nests. I copied this picture, but hopefully I’ll get my own photograph next year. 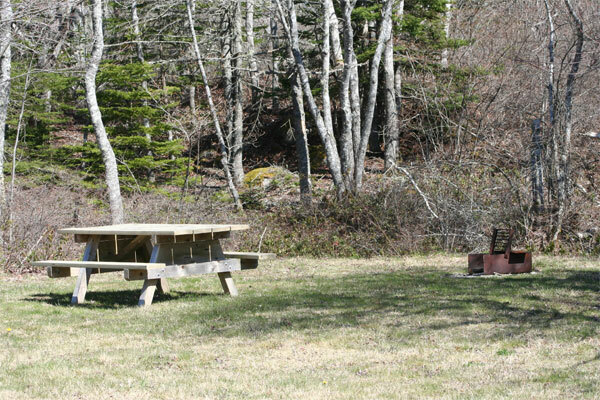 All of the camping sites have their own picnic bench and fire pit, just like the Five Islands Provincial Park we visited in September. When we were there we looked across the Bay of Fundy to Blomidon, this time we looked back to the Five Islands Park. These bracket fungi look as if they are little shelves or steps on the trunk. Perhaps even some wonderful sculpture. On the way home we passed a bluberry farm and I had to take the bushes with their scarlet leaves. This is just the conclusion of our weekend at Joggins, when we stopped at Five Islands Provincial Park for a hike on the Sunday morning. 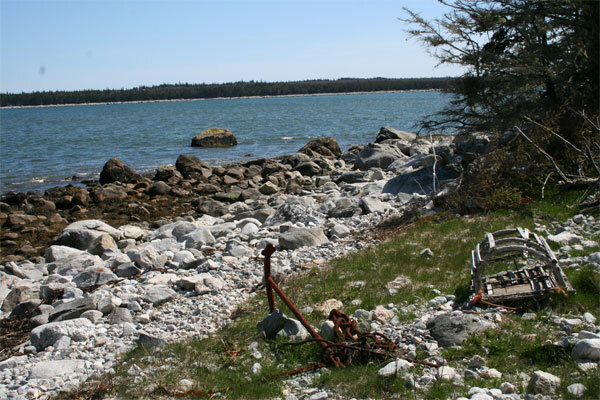 This park rises from the shores of the Bay of Fundy, with the highest tides in the world. Many campers had taken this last opportunity to camp, before the camping grounds closed for the season the next day. There are group camping places, but mainly individual spots, each with its own picnic table and fire pit. These campers had made a covered dining area to keep off the mosquitoes. We hiked through the park and down to the beach. The tide was out, way out, and people were arriving to collect the semi precious stones that can be found after every tide. Clam digging is another big event here. These people are out on a spit of sand digging. Here you can see how far out they are! And this couple seem to have some sort of little trailer with them. They came from the opposite side of the bay. The split rock on the next photo is Cape Split! We were there when we walked at Blomidon Provincial Park last year. It doesn’t look to far in the photo, but it is 250 kms by road, because you have to drive around the Bay of Fundy. You can see how the water drains out of the Bay at low tide, leaving a very red mud – a bit messy for paddling. But fantastic for beach combing.